Console Inc is Looking for Android System Engineers! Join the team helping make the world’s most popular OS deliver… on the most powerful hardware yet. Want to be part of a startup that is determined to break all the rules… delivering a robust, free version of Android for the PC that is both consumer, and OEM friendly? 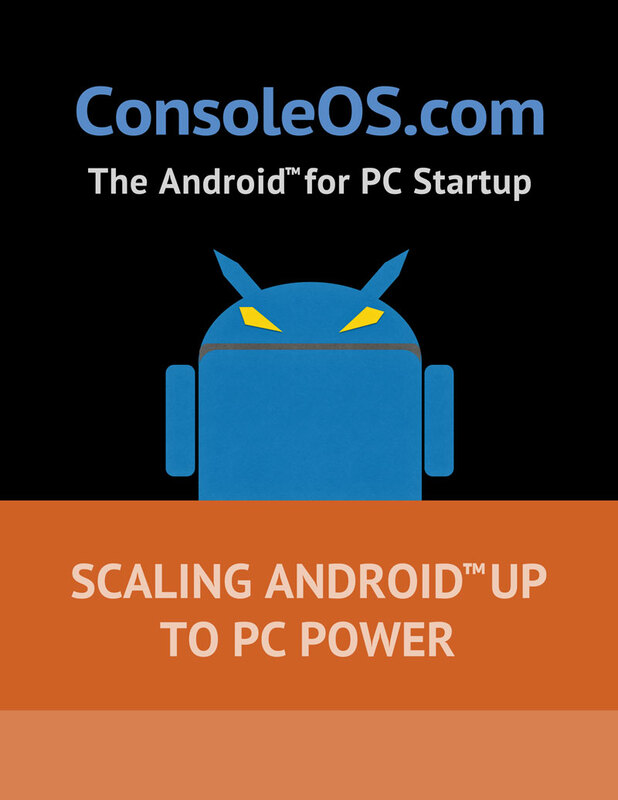 Console OS is Android™ remastered for the desktop – we’ve quietly been working inside the industry over the past 24 months, licensing all the bits to properly implement Android as a daily driver, keyboard-and-mouse friendly operating system – minus the gatekeepers. Our operating system is targeting 2-in-1’s, PC Tablets, and garden variety laptops and desktops. We envision a future where your PC Tablet can support native Windows™ and native Android (via Console OS), and toggle between them instantaneously. We’re looking for passionate Android System engineers. People who have built Android either in the professional community, or in the homebrew community. If you know your CyanogenMod from your OmniROM, and think of Gerrit as something other than an odd name for a friend, you probably should keep on reading. While it’s taken quite a long time to get all our ducks in a row, we’re on the eve of shipping our first developer release – after a very successful Kickstarter campaign, and winning startup awards at places like Vator Splash LA this summer. We’re looking for people to help with all aspects of Android System development on the PC, from kernel, to our UEFI bootloader, to user experience and userland features. If any or all of this seems up your alley, use the contact form below and send us your Linkedin profile/PDF resume, and a brief introduction. Legal: No agency resumes, please. This is not an offer of employment. We’re happy to look at your resume and background to see if you’re a good fit for talking further about opportunities in working with our team. Thanks!